A sample from my downline! 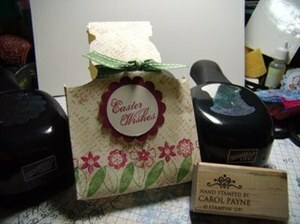 My downline, Linda, is a fantastic stamper. She emailed me this card today. She used the Floral Background, Sincere Salutations , and Live Your Dream,a new set in the Occasions Mini that begins on March 1st. This set coordinates with the designs in the new Designer Series Paper also in the Occasions mini, Afternoon Tea. 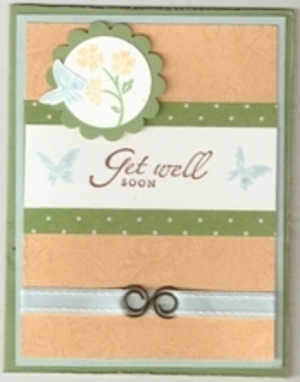 Linda used Wild Wasabi, Apricot Appeal , Soft Sky, and Whisper White cardstock, as well as Wild Wasabi Designer Series Paper from the Level One Hostess Set, Prints Pack . Live Your Dream is in an order on it's way to me right now, I can't wait! If you haven't received your copy of the Occasions mini by now, give me a call or email me and I'll make sure you get one right away! I had another snow day today! I have been catching up on alot of things that have been on the back burner for quite awhile, so I'm excited to start to feel relieved and have more time for my favorite past-time, stamping! I hope to have more cute projects to show you soon, so check back often! Envelope Easter Basket on a Snow Day! some on my taxes, then perhaps I'll have something more to show you! Later! "Leap Year Day Stamp Camp!!" My next Stamp Camp is scheduled for Friday, February 29, 2008, 6 p.m. This FREE camp will feature an Easter project and another using the new "Sticky Cuts" letters! All merchandise orders of $50 or more will be put in a drawing for either "A Little Birdie Told Me" or "Mark the Date" stamp sets, and all orders of $100 or more will be put in a drawing for a $20 gift certificate for additional merchandise to be redeemed at the camp! I haven't had a camp for awhile, so I am very excited about this event! Custom Baby Announcement and a Blog Special! I created these little baby announcement favors the day after Cohen was born, and they've been a big hit with stampers and non-stampers! I printed his "stats" on Bashful Blue cardstock, 5 to a side, so I was able to get 10 printed announcements to a sheet. After I punched them out with the Scallop Circle Punch , I was still able to punch 10 more blank scallops to mat behind the All in the Family baby boy on the front. 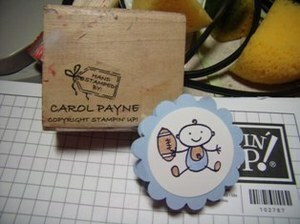 The baby is stamped in Basic Black, and colored with Stampin' Write markers. I also stamped the football from Family Accessories. The first thing my son-in-law, Johnny, said when he stuck his head out the delivery room door was, "I've got my linebacker! ", so the football is in Johnny's honor! 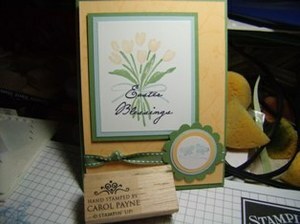 I just love the way I can customize just about anything with my stamps! I've been giving these away at all my parties this month, as well as to family and friends and at my work. They make a neat advertisement for what you can do with your stamping stuff too! From now until February 28th, 2008, I am giving a 20% discount on all orders placed with me via email or phone. 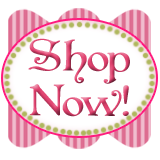 You must mention this blog special in order to receive it, and this special does not apply to any orders placed at hostess events (parties, stamp camps, or technique classes) All orders will be shipped directly to you with a minimum shipping cost of $3.95 for all orders with a merchandise total of under $39.95, all orders with a merchandise total of over $39.95 will have 10% shipping added in accordance with Stampin' UP! guidelines. The tax charged will depend on the tax rate where you live. And don't forget! All orders that have a merchandise total of $50 or more qualify for a free stamp set from the Sale-a-bration Mini Catalog! You can also turn in a catalog order of $150 or more (orders from yourself and a few of your friends) and receive the same 20% discount as well as SAB sets and hostess benefits! This is another way to get hostess benefits without having to clean your house or make snacks! Call or email me before 10 p.m. on Thursday, February 28th to take advantage of this great special! As an added service, I am now offering for sale custom-made cards, scrapbook pages, baby, party, or wedding invitations, announcements or favors.Give me a call and we can design something that is especially yours! I know it's been forever since I blogged, but with Christmas and the new catalog, going to Leadership in Palm Springs, CA, and now a new grandson, I've been swamped! 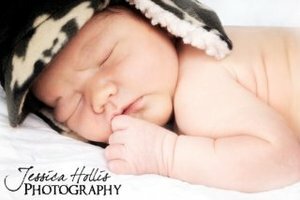 Johnny Mark Cohen Hollis arrived on February 7, 2008 and weighed 8lbs, 3 oz. He was actually due on Valentine's Day, so he would have really been a big fella if he had waited another week! I had the wonderful privilege of being able to stay with my daughter and help take care of him for a few days, which makes being a Grammy all the more sweet! In honor of Cohen's (we are calling him Cohen, even though his first two names are for his two grandpa's, he is the first grandson on both sides of the family!) I am offering you all my very first BLOG SPECIAL! See my next post for details! P.S. If you want to see more pictures of Cohen, click on the blog link on the right to my daughter's blog, It's a Sweet Crazy Life! She is a professional photographer with her own in-home photography business, so she is having a ball taking newborn pictures of Cohen!